I had an opportunity to sample Kelly & Jones' Notes of Wine Collection (now known as the Reserve Collection) when it was launched in 2012, and I'm not quite sure why I never got around to reviewing it. I liked the concept, which felt very fresh at that moment, and I particularly enjoyed the Riesling and Pinot Grigio blends. In any case, I've been following this indie brand's gradual, well-paced evolution, which now includes a collection inspired by the agave-derived spirit called mezcal. The Reserve Collection was originally sparked by visits to vineyards and wine-tasting sessions, and the Mezcal Collection explores "a new type of terroir" inspired by work and travel in Mexico. It's comprised of two fragrances designed to "take you into the agave fields and palenques---local distilleries---of Oaxaca. Each essence captures the aromas of various types of mezcal, and its wide range of tasting notes." Mezcal Blanca is "a blend of sheer citrus and solar resins," with notes of peppercorn, palm, sea salt, juniper and star anise. Mezcal Negra is "a blend of smoked woods and mystical spice," with notes of pine, black lime, guaiac wood, cajeta and clary sage. Both scents can be shared by women and men, and both are a little more abstract than the wine-inflected blends of the Reserve Collection. Mezcal Blanca surprised me by getting its olfactory hooks into me; I'm not usually a "sheer citrus" person, but here the lime note is balanced by the black pepper. The juniper is a bit too prominent for my taste initially, and I feel like I'm wearing a traditional men's fragrance. However, once it settles down, I can savor Mezcal Blanca's salty ozonic heart, which strikes a nice balance of "warm" and "cool" sensations. (I think the anise note is part of that effect, too.) Now that fall is finally here, the salty-musky, skin-scent feeling of Mezcal Blanca's dry down makes me feel nostalgic for the good things about long summer days — sunlight, warm summer breezes, cocktails outdoors. Mezcal Negra didn't entrance me quite as much, but I admire its smooth composition. It's a very on-trend, aromatic herbal-woody (but not smoky) blend enhanced with a head-clearing aura of resins. The sweetness in its base puzzled me at first, since it wasn't quite vanillic but I couldn't figure out what it was emulating instead. Then I looked up "cajeta" and learned that it's a type of Mexican spiced caramel sauce, which makes total sense in this context. Like Mezcal Blanca, Mezcal Negra has impressive tenacity without ever feeling too intense. Kelly & Jones also recommends layering the two perfumes, which I haven't tried yet but could yield some interesting results. The connection between smell and taste is close, complex, and fascinating; there's been more attention to this idea lately in the fragrance world, it seems to me, and I'm all for it. Years ago, I approached wine and beer with a different attitude when I learned about their "notes," and when I really began learning about perfume in earnest, my interest in well-mixed cocktails followed a similar timeline. Come to think of it, I've never actually tried mezcal. Thanks to Kelly & Jones, I'll be adding it to my list. I'll even wear these fragrances when I do finally try it. 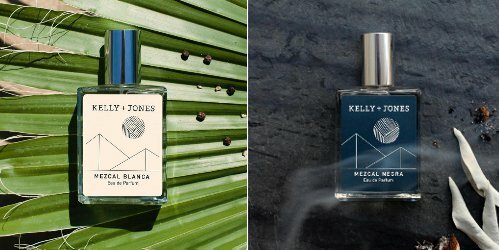 Kelly & Jones Mezcal Blanca and Mezcal Negra are available as 50 ml Eau de Parfum ($95 each) at the Kelly & Jones website. 10% of every sale goes to Programa Vaca, a "Mexico-based organization is helping to rebuild in the country's earthquake-affected rural areas with sustainable architecture and natural materials, for long term, positive human impact." J: I know you are “trapped” at home…do watch “Destilando Amor” if you love Mexican soap operas…set in the tequila fields! HA! These sound like fun. I just started drinking mezcal and love the simple cocktail of it and dark ginger ale and lime juice. Mezcal packs a punch. Oooh, that does sound good. Knowing me, I’d have to go *very* light on the mezcal, at any rate! I love a good cocktail, but I have very low tolerance! These sound interesting, Jessica! I think I like the idea of the Mezcal ones better than wine. I’m not sure why one makes more sense to me than the other. I’ve never tasted Mezcal, either. I simply don’t like the idea of smelling like wine. I love the cognac and creme brulee of Frapin 1697, though. Well, they’re meant to complement wine, I think, rather than to imitate wine closely — so you wouldn’t smell like you’d spilled wine on your clothing if you wore one! I really did like the merlot — berries and violets! Mezcal has a really interesting smokiness to it. Very tasty in a cocktail and a great idea for a fragrance. I look forward to trying these, thanks for a nice review! These weren’t as smoky as I expected, but I liked them! — and I really do need to find a NYC-area bar that serves up mezcal now! I am dissapointed that they didn’t pull that unique note to shine in the fragrances. Still, I’d like to try these, sound tempting nonetheless. These sound great… I spent time in Mexico earlier this year at a traditional mezcaleria and was able to sneak a bottle back with me. The smokiness is beautiful but intense… we whip up a Negroni with it on occasion and it’s heaven!